The Editor is the most important feature in an IDE and the code assist features in the Editor helps in developing applications quickly and hence help in increasing the productivity. One of features is the 'auto insertion of tag attributes'. Most of the tags in ColdFusion have a mandatory attribute, for example the attribute 'name' is mandatory when using the cffunction tag. 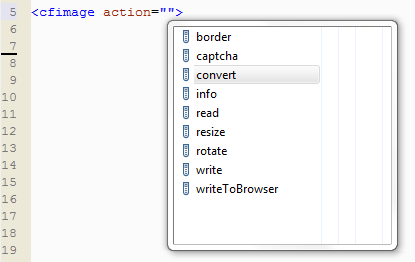 In ColdFusion Builder 2, these attributes are auto inserted i.e. when a user types in the cffunction tag and invokes code assist (using CTRL + SPACE) the name attribute is auto inserted. auto insertion also works for function arguments wherein the required arguments are auto inserted. Another thing to note here is that, after inserting the required attributes the cursor is positioned such that one can go about specifying the next attributes' value. When this function is invoked using code assist, the required arguments are auto inserted. As seen above, arguments arg1 and arg2 are marked as required and are auto inserted when the function is invoked. After inserting the required arguments the first argument is selected so that the user can go about specifying a value for the argument. The tooltip here shows the list of arguments that the function accepts along with the argument type. The last argument - arg3 is marked optional and is surrounded by square brackets indicating that it is optional.